To create a society that understands, recognizes, respects and promotes women’s equal participation in economic empowerment with a focus to alleviate poverty without discrimination. Safe water access allows women to dream bigger and create better lives for themselves and their families. 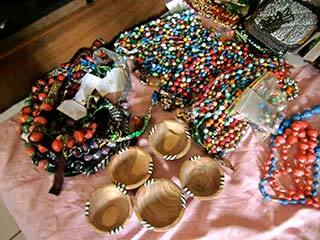 Artisans hand beading necklaces, bracelets & earrings. With less time spent in acquiring water, income-producing activities are welcomed and embraced. With new income opportunities, the doors to economic empowerment open, leading women to many new levels of decision-making, community participation and social justice. In 2011 It Can Be Done provided guidance and start-up support to a small group of Uru village women interested in building skills & creating fair trade products. 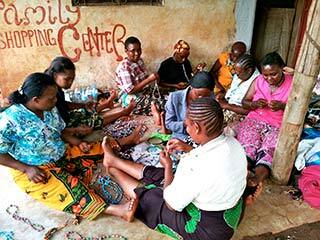 The Acorn Women’s Cooperative is now a Tanzanian NGO that provides strategic capacity building for Uru women with sewing, quilting, craft making and small business skills for product and market development. It Can Be Done continues support for their essential capacity building with grant funding for training, building improvements and equipment, as they strive for self-sufficient sustainability. 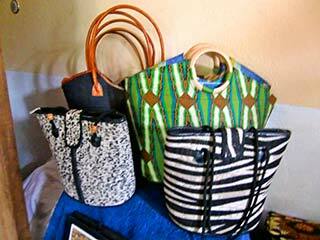 income earning possibilities for hardworking Uru women. Support Women’s Initiatives — DONATE NOW! 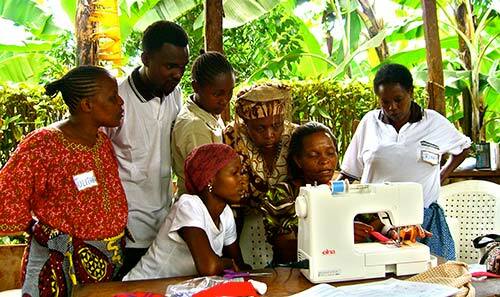 Acorn women learning new skills. & home decor are a few of Acorn Women handcrafted products.